There are lots of recipe like this and delivers or make procedure differently. I don't say it taste no good to others but I may say all is taste delicious. But this is how I cook this Simpleng Luto recipe. Boil sliced pork until it become soft add oil and make it look brownish. Set aside. Saute the garlic and onion in the oil where pork is cooked until the onion becomes soft. Pour-in the coconut milk together with the ingredients and pork. Stir and never stop until it boil. Add the kalabasa. Cook for 8 to 12 minutes or until tender. 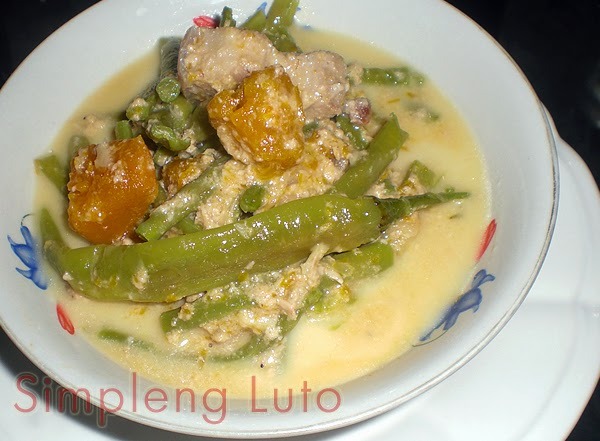 Add the string beans (sitaw). Cook for 2 to 3 minutes.